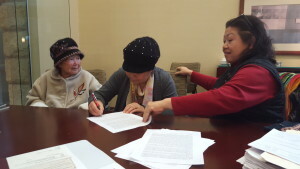 Chue signs paperwork to close on her home! “My husband was the one who encouraged me to buy a home. Now he is stuck in bed, cannot speak or eat…I moved forward with the home buying on my own and hope to see him out working in the yard again soon,” she said. Chue found out about ACTS from a relative who was also an ACTS homeowner. At closing, Chue said: “Once my kids are looking for homes, I will refer them to ACTS.” Referrals like this are common—once an ACTS homeowner’s family and friends realize homeownership is attainable, they return to ACTS’ trustworthy financial counselors, community brokers, and rehab specialists that made it possible in the first place. ACTS caused, and continues to cause, a chain reaction that is spreading through Milwaukee’s most challenged blocks and creating vibrant neighborhoods. As more families hear about the possibility of homeownership with ACTS, more resources are needed. As we close 2015, we ask you to consider making a contribution to ACTS Housing, to allow us to continue empowering Chue and countless other families.